Hidden objects and romance on a Hollywood lot! 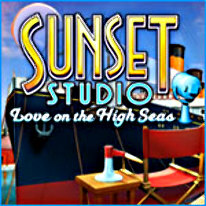 Search star-studded Hollywood sets for cleverly hidden objects, and keep a big budget blockbuster from sinking - literally, in Sunset Studio: Love on the High Seas! In this exciting sequel to Sunset Studio Deluxe, Katherine Connick, the temperamental and demanding star of "Titanship", just can't find anything for herself. But really, why should a star have to look for anything anyway? That's what assistants are for! Help keep this unsteady production afloat by sifting through a variety of studio locations and collecting valuable production pieces before time runs out. From the creators of the hit Little Shop series of games, Sunset Studio: Love on the High Seas features vibrant scenes to search, six amazing power-ups, a hilarious storyline, and whole lot of Hollywood glamour. Play Sunset Studio: Love on the High Seas and discover the kind of romance that can only be found on an imaginary sinking ship. Play the Sunset Studio: Love on the High Seas on a computer near you!